Autoflame is a world leader in the design and manufacture of boiler/burner auxiliary products. ATI has chosen to connect its customers with Autoflame because it is a proven company whose products have stood the test of the harshest operational environments. Autoflame's boiler/burner management systems are ideally suited for industrial/commercial applications and result in increased efficiency, reduced emissions, and greater operational reliability. Their systems are built out of rugged steel and equipped with touchscreen interfaces; they are a perfect combination of durability and convenience. 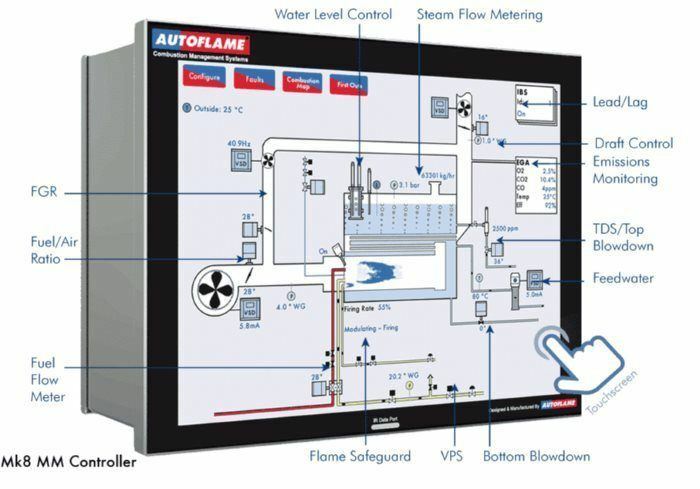 Autoflame offers a large number of auxiliary products in numerous categories, including: control panels, servo motors, various sensors and control valves, water level and draft control units, emissions monitoring and trim products, and multi-boiler monitoring systems (data-transfer interfaces). However, probably their most central products are their boiler/burner controllers, which work effectively on both large and small steam boilers, such as are typically used in commercial, industrial, hospital, hotel, and school/university applications. 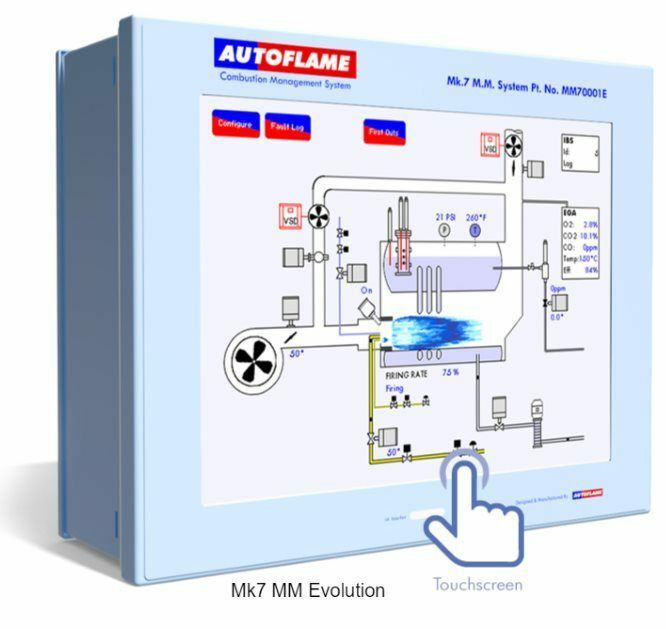 The Mk7 MM Evolution is a complete, six-channel, micro-modulating control system for industrial boilers/burners. It comes complete with Flame Safeguard and is easy to manage from its 10.4-inch touchscreen interface. With the optional PCB expansion board, additional features, such as water-level monitoring, draft control, and steam/heat flow metering are enabled. The Mk8 MM Controller is the direct replacement for the Mk7 MM Evolution. 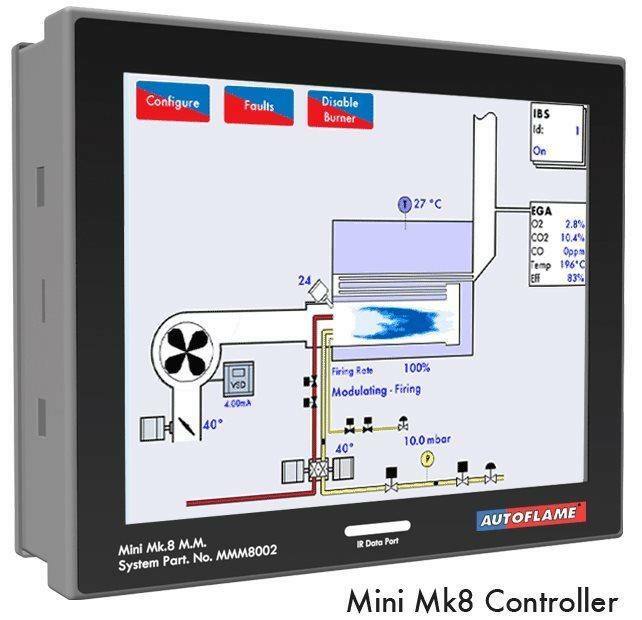 It has a large, 12.1-inch multi-touch screen, is much easier to upgrade, and offers additional features, such as linkageless servo motor, automated Flame Safeguard, and Modbus connectivity for remote monitoring/management. The Mini Mk8 Controller replaces its predecessor, the Mini Mk7. The Mini Mk8 can reduce fuel consumption by 5% to 7% and CO² emissions by up to 10% through its advanced efficiency technology. It improves on the Mini Mk7 through numerous additions, including: HD XVGA touchscreen, software updates now accessible via Micro SD Card, a dual-core safety processor, ability to schedule five states per day, and Low Flame Hold integration that eliminates any need for panel-switch operation. You can use the Autoflame calculators to see how much their products could save you annually and how long they would take to "pay for themselves." You can also download their free fuel savings report to get a better idea of your potential ROI. If you're interested in learning more about Autoflame's products, fill out the form at the end of this article to schedule a free consultation with one of our boiler experts.